The Canon VIXIA HV40 HDV Camcorder, a replacement to the highly acclaimed VIXIA HV30 camcorder, shares the core components found within the VIXIA line, but also offers a Genuine Canon 10x HD Video Lens and 2.96 Megapixel Full HD CMOS Image Sensor. 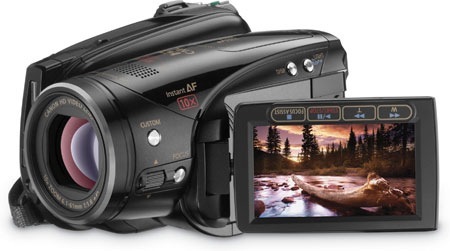 What’s more, the camcorder allows consumers to record in native 24p Mode, a feature previously found only on Canon’s professional camcorders. Native 24p allows consumer to capture and record 24 progressive frames per second to a HDV tape, a big advantage for the serious filmmaker. Another add-on feature, Custom Key Mode, enables consumers to assign commonly used functions to a single button on the camcorder for easy access. What is 10X HD Video Lens? What is the difference between HV20’s len and HV40’s? I believe this lens is better… some research will turn up more details. Will This camera finally fix the jelly effect or rolling shutter problem? Can I shoot with a 4 track lav system (4 actors laved)? can you use sony pro 9 on a pc to export the video?